Jason Byrne and his three brains. 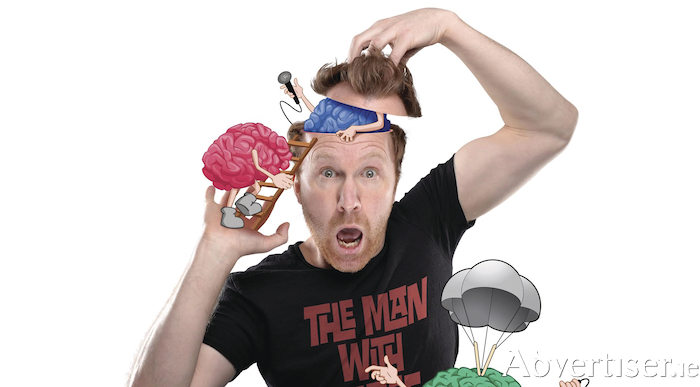 ONE-MAN comic maelstrom Jason Byrne whirls into the Town Hall Theatre on Saturday March 10 at 7.30pm with his new show, The Man With Three Brains, which has been drawing rave reviews and sell-out crowds. Jason has three brains which kick into action when he hits the stage. His left brain scans the audience, looking for improv moments. His right brain collates stand-up material and stunts, poised to dish out the funnies at speed. His centre brain is Jason’s coach, pushing him to the limit. This laugh-a-minute show peels back the madness inside Jason’s head to reveal all three brains working individually. "The Man With Three Brains is a fun title and all it needs is a chaotic situation where I’m dealing with absolute madness on the stage and that’s the show! People are going to get up onstage with me and do a bit of a dance routine and other stuff so there is all sorts going on. I only chose the title because somebody said to me after a gig; ‘You’d need more than one brain to do that show’. “I said ‘that’s a great idea I’ll call it The Man With Three Brains because I always separate my stuff into three sections which are stunts, stand-up, and improv, so that’s what the three brains are. During the show, Jason also talks about the vasectomy he underwent last year. “It’s not the most welcome procedure,” he notes, wryly. “If anyone is messing about with you in that area it’s not great, and especially when it’s medical. As I say onstage, even when your missus is messing with your balls you feel a bit nervous, but when it’s a guy with a knife! The past few years have been mega-busy for Byrne. As well as fronting a comedy chat show, Jason Byrne's Snaptastic Show, for TV3, he also co-hosted the hugely popular entertainment programme Wild Things on Sky1, and is one of the judges on the new TV3 series of Ireland’s Got Talent. Another recent project was comedy short, The Rug, which Byrne co-wrote with Sharon Horgan, and in which he and Amy Huberman played a married couple who steal a rug. Byrne would like to write a series around these characters. This is a 'Róísín Dubh presents...' event. Tickets are available at www.roisindubh.net, the Ticket Desk at OMG Zhivago, Shop Street, The Róisín Dubh, and the Town Hall Theatre (091 - 569777, www.tht.ie ).